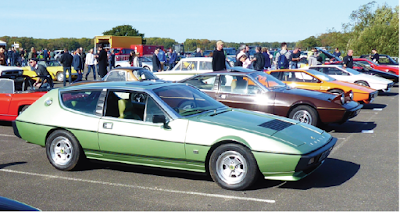 2018 marks the 70th anniversary of the Lotus car company, and the occasion was marked with a huge celebration at its factory in Hethel on 29 September. If you have been following Oliver Winterbottom's diary here on the blog, you'll know that he was invited to attend this incredible event. In today's blog, we bring you his account of a truly historic day. Take it away, Oliver! The day dawned sunny and bright, and I left my home at 8:50am for the five and a half mile drive to the Hethel Engineering Centre. This was the car park for VIP guests arriving in non-Lotus machines. My Google map showed a solid traffic jam from Wymondham so I was a bit pessimistic. The last mile was slow, but I was parked and in the minibus provided for the last half mile by my target time of 9:30am. Patrick Peal, ex-Lotus and now Chief Executive of the East Anglia Air Ambulance service, was another passenger as we crept up Potash Lane, passing Martin Cliffe, ex-Lotus, now running Omicron Lancia services, who was arriving on foot. In front, Mike Kimberley was making his way in, despite agreeing to meet me at the car park! All is forgiven, Mike. On the way, we passed the beautiful new HQ for Classic Team Lotus, which I understand was finally occupied last week. Upon arrival, my first call was to Club Lotus. The various Lotus clubs were located on the front factory car park, and a fine sight too. Rows of Lotus Sunbeam's, Carelton's and all varieties of pure Lotus shone in the morning sun. I was making for Club Lotus, as they exhibited my book, A Life in Car Design, taking orders on the day. The event rules prevented actual sales, so it will be dispatching the books over the next few days. I supplied a sample book and poster to assist Jane Woollestone in her efforts. I understand very successfully. Immediately I bumped into John Mountain, past electrical engineer who served for many years. We started to walk back towards the test track but stopped at the LotusExcel.net club site, where Woollaston's superb Lotus Elite shone in the sun. We learned that Angus Marshall, stalwart leader of the club, was unable to come due to an electrical fault on his Excel. Not John's fault after nearly 40 years! On my way to the VIP Reception Centre, I found Brian Angus and Geoff Davidson, with wives, filling the pathway. After a brief hello, I suggested trying to meet after the show. As yet, that hasn't happened, which is a shame, as both gentlemen played a significant role in my career. Upon arrival at the VIP Lounge, close to the ex-wartime Control Tower/Clubhouse, the first person I saw was 'The Ginn'! Malcolm Ginsberg was the PRO in the early 1970s and we haven't met since. Amazingly, he has barely changed! Next was Russell Carr. Russell is the Head of Styling and Design at Lotus, and it was great to meet up again. It was cut short, so I hope we can catch up again in the future. He told me that he posted photographs of the Lotus designers in the studio, but sadly I did not have time to look at them myself! Andy Tempest, ex-Financial Director, was my next meet, followed by instructions about my interview from Alastair Florance. I was to follow Clive Chapman in being asked questions by Guy Munday, the commentator. I managed a pretty decent plug for my book, and perhaps surprised some by answering the question, what made me most proud, with: Finishing the Opel Vauxhall safety project already 22 months shorter than GM Europe could manage – with the first car on the production line in Luton two weeks early. That was Lotus! 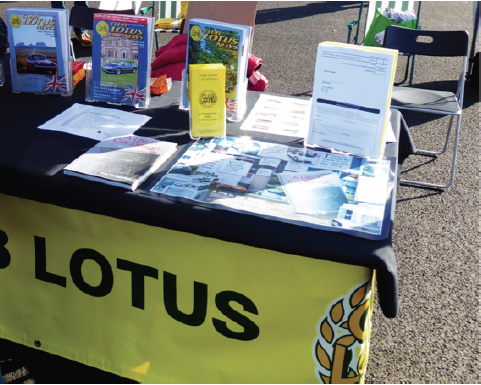 I then returned to the Club Lotus stand, as I promised to be there in person to support the book sales. (These, incidentally, were very good.) I love the enthusiasm of the Lotus followers; I signed a spoiler, an engine bay and had my name on the side of a fine example of the product. Various folk asked for me to pose by their cars, all of which I was very happy to do. It was now getting past lunchtime, and I returned to the Hospitality Lounge. I was delighted to see Hazel Chapman arrive, 91-years-old, and I sat with her and had a good chat. 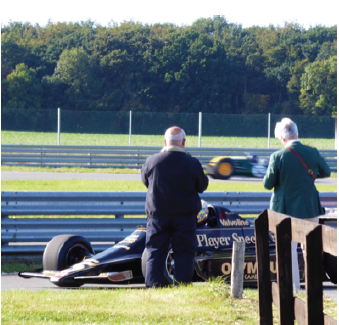 One interesting observation was that a number of Chinese attendees were amazed at the noise the Classic Team Lotus racing cars made. These days, Forumla 1 is somewhat quieter! My next meet was with Van der Koi, the Lotus dealer in Kwinkweerd (love the street name), Lochen, The Netherlands. I was there in May 2011 with Bauke Kooistra, a great enthusiast, to give a talk after a great day at Appeldorn. Although Bauke was at Hethel, I failed to find him – hi Bauke! My next task was to find the beautiful green Elite shown above. This car now has Mike Kimberley's and my signatures in the engine bay! While admiring this car, three retired ex-Pattern Shop lads came up. They told me that the old skills – and they were as good as any – have now been replaced by computer modelling equipment. Apparently, Lotus still have a traditional timber shaping workshop, but it is only used for production issues. Sad for me – but then I am from the pencil and paper, carve the wood, era. Throughout the day, there were various demonstrations on the test rack. Geely Lotus had a large grandstand and the VIPs got to view from the old Clubhouse. Clive Chapman had a huge exhibition, but also had an amazing number of Formula 1 cars running. How they could prepare that many, I am amazed. They ranged throughout the whole history of Team Lotus, and were a joy to watch and hear. 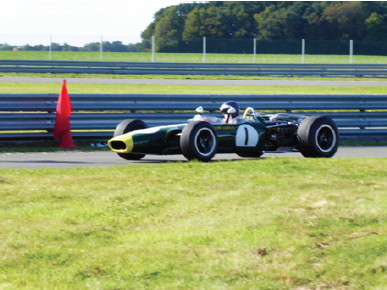 Racing cars driving around Hethel – that brought back some memories! I recall, back in the early 1970's, Formula 1 cars were tested on the old track, driven by the works drivers like Fittipaldi or Peterson. Everyone in the main office would be looking at their watches to time the car as it roared past the front door. If the lap time came down, there would be an audible murmur. Not very good for productivity, but superb for morale! My next meeting was with Roger Pestle, who lives in the cottage at Ketteringham Hall that was my first daughter's birthplace. He told me he still did odd jobs for Clive's Classic Team Lotus. Chris Dunster, one of Lotus' longest serving design engineers, was my next reunion. Chris spends most of his time sailing in his retirement, so it was nice to see him on dry land. A few minutes later and Anthony Kimberly, Mike's 'middle' son arrived. "My, how you have grown" seemed appropriate, as I hadn't seen him since he was about 7-years-old – he is now in his 50s. I needed the toilet, and was surprised at the quality of the VIP temporary facilities. However, it summed up the quality of the whole day to read on a website that the 'ordinary folk' arrangements are way above the normal, flimsy Portaloo's used at open air events. The same website correspondences also praised the quality and price of the food and drink. I think that summed up the atmosphere of the day. A very rewarding chat was held with Feng Qingfeng, the Chinese CEO of Lotus. I have great sympathy for him, as he does not speak English (but has an efficient interpreter) and is living in a completely new culture. I had sympathy, having experienced the same in reverse when I worked in China. I wished him every success, and have been so impressed with the future outlook for Lotus. With 1500 Lotus cars and 7000 ticket holding people, it was a very fitting day to celebrate Lotus being in existence for 70 years. I believe that its new caretaker, Geely, will see it safely into the future. 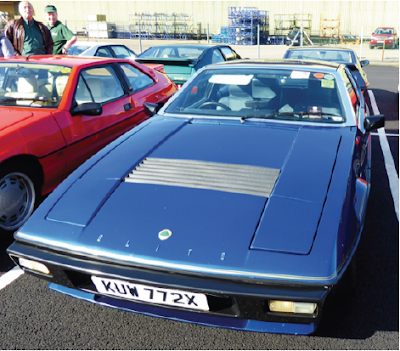 The Chinese have a great respect for the company's history, and the day before the event, announced the creation of a new Heritage centre for Hethel's history and Lotus. This is an interesting reversal of the events back in 1998, when the historic collection of cars was sold. The attempt to fill the whole 2.5 mile test track with cars nearly worked! What a sight! This was a day to remember, and with talk of another gathering next year as a possibility, I cannot wait for it. Thank you Geely, thank you Lotus, and thank you Lotus Forum. It was worth what must have been very hard work. You can purchase your own copy of A Life in Car Design here, and make sure you keep checking the Veloce blog for the next instalment of Winterbottom's diary!